On March 10, Lucchese opens its fifth store (third in Texas) inside Austin's famous Allens Boots just in time for the South by Southwest® (SXSW®) Conference. Collaborating with Allens felt like a natural fit considering our long-standing partnership and their powerful presence in Austin. Lucchese, the legendary El Paso-based bootmaker, is pleased to announce the opening of its fifth store inside Austin’s esteemed Western wear store, Allens Boots on South Congress. Doors open March 10, coinciding with South by Southwest® (SXSW), the music, film and interactive conference, which descends on Austin March 11-20. Lucchese had been scouting Austin for another stand-alone, flagship location to join Houston and San Antonio when the opportunity arose to create Lucchese at Allens, a store-in-store concept with long-time partner, Allens, the largest single-store dealer in Lucchese’s network. Lucchese’s handmade boots have been featured at Allens since 1978. Designed by Lyn Muse Interiors, Inc., the award-winning firm that outfitted the Houston store, the 1400-square-foot space evokes Lucchese’s Western heritage and handmade craftsmanship while also honoring Allens’ strong foothold in Austin. The South Congress store’s original brick walls, tin ceiling and reclaimed wood floors date back to the late 1800s, around the same time Lucchese set up shop in San Antonio. This vintage foundation coupled with contemporary touches helped create a casual vibe that reflects the individuality of the city, Allens’ established brand and the diverse clientele. "After 38 years, Allens continues to evolve and that's very exciting for our brand,” said Erin Slade, General Manager of Allens Boots. "This opportunity gives our employees and customers something new and exciting to look forward to. As for Lucchese, we’re thrilled to be working together on this new venture – here’s to another (almost) 40 years!" In addition to the legendary, handmade Western boots hooking visitors as they enter, Lucchese at Allens offers an evolved assortment that includes Western-inspired footwear, apparel, belts, jewelry and accessories. Another standout feature is a custom boot area with countless leather options allowing customers to design their own Lucchese heirloom boots. Look for the Lucchese at Allens’ branded entrance at 1522 South Congress Avenue just shy of Allens’ iconic red boot sign. Store hours are 9-8 Monday through Saturday and 12-6 on Sunday. For more information call 512-447-1413. 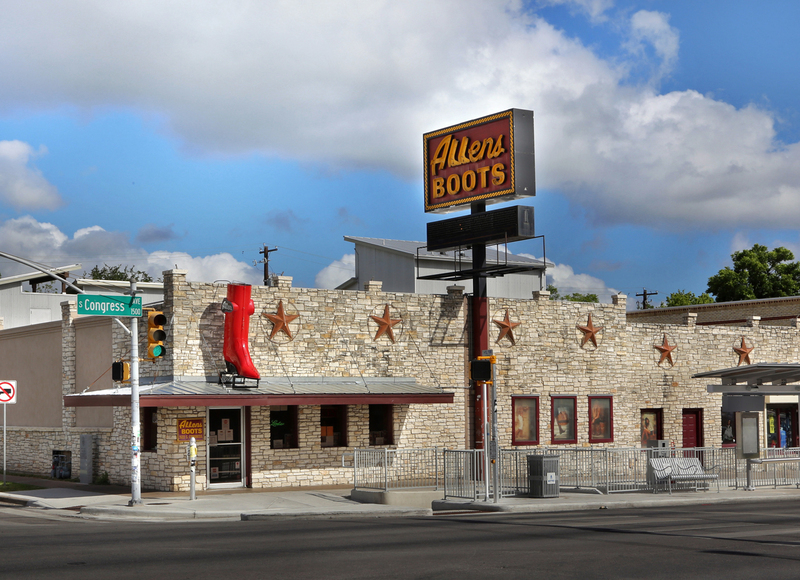 An Austin tradition since 1977, Allens Boots is family owned and located in the heart of the South Congress shopping district. Allens offers a variety of cowboy boots, hats, buckles and apparel for every occasion. Home to iconic Western brands Lucchese, Ryan Michael, Stetson and Scully, Allens Boots can outfit the entire family from head to toe. With over 10,000 boots to browse, Allens offers one of the largest selections in the country! Can't make it to Austin? Visit us online http://www.allensboots.com.